Add 2-4 liters of water. Cover the mouth of the pot securely with the cloth and leave it as such for 3 days. Strain to get clear extract. Dilute 1 liter of neem leaf extract with 9 liters of water. Add 100 ml of soap. Spray on the infested plants. Add 10 liters of water. Dilute 1 liter of this extract with 9 liters of water. Remove shells and pulps from seeds in the desired amount. Then pound seeds gently in such a way that no oil comes out. Once done, put the desired amount of powder in a pail of water. Stir well for about 10 minutes and steep for at least 6 hours but not more than 16 hrs. Stir it again for another 10 minutes. Spray on the infested plants thoroughly. Spray early in the morning or late afternoon. Put the finely ground seeds into a basin. Add hot water little by little until it is possible to knead the mixture. Knead and press the mixture to get the oil. Approximately 650-750 ml oil is extracted from this mixture. Take desired amount of neem oil and mix with soap before adding water. Stir thoroughly to prevent oil separation. 1. Pound neem leaves or seeds or neem cake. Put it in a clay pot. Add twice the volume of water, then cover securely the opening of the pot. Let it stand for 3 nights. To use, divide the filtrate into 4 (or more) and put these separately in opened containers. Place containers in strategic areas in the field at night time to repel nocturnal pests. The smell repels the insects from coming into the field. 2. Fill in jute sacks with neem cake. Place the sacks along the water canals. The dissolved neem cake carried into the field prevents the attack of pests and diseases affecting the roots and tillers. 1. Neem seed extract should be milky white in color and not brownish. If pounded with the seed coat on, 1 ½ times the amount of seeds are required. 2. It is very important to add the soap with the oil before adding water. It should be used immediately otherwise oil droplets will start floating. A knapsack sprayer is better for neem oil spraying because it has the tendency to mix the extract while in the process of spraying. 3. The 3 extract formulations can also be used for fungal diseases control including those that are soilborne. Neem cake can be used as soil manure- to improve the soil condition and to control various species of nematodes. Precaution: Oil maybe phytotoxic at a ratio of 10 ml oil/liter of water on sensitive plants. Wait for 2 days for the effects (symptoms) to appear before going into large scale application. None; the proper use of neem has not been associated with any side effects. Azadirachtin is relatively harmless to butterflies, bees, ladybugs, and wasps since these beneficials feed on nectar and pollen. Azadirachtin must be ingested to be effective so that pests which feed on plants are affected by its content. However, constant spraying of flowering plants with highly concentrated neem products affect bees since they carry contaminated pollen and nectar to the hives (National Research Council, 1992). A study was conducted on neem products and their effects on mortality, growth, and reproduction of 7 species of earthworms. Various neem products were incorporated in the upper 10cm soil layer of tomato plots. None of the materials had negative side effects on earthworms. Positive effects on weight and survival were found in soil treated with ground neem leaves and ground seed kernels under greenhouse conditions. Reproduction was slightly favored over a period of 13 weeks in a neem-enriched substrate in rearing cages (Rossner; Zebitz, 1986: pp. 627-632). Azadirachtin has no side effects on birds and other animals (Martineau, 1994). There is no toxic residue left to contaminate the environment and insects do not develop resistance to neem (Prakash; Rao, 1997: pp. 35-103). Martineau, J. (1994): MSDS for Azatin-EC biological insecticide. AgriDyne Technologies, Inc.
National Research Council. 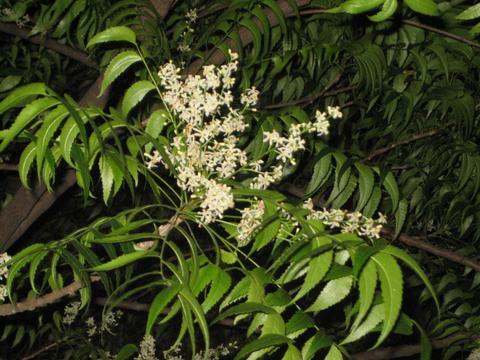 (1992): Neem: A tree for solving global problems. National Academy Press. Washington, DC. Rossner, J.; Zebitz, C. (1986): Effect of soil treatment with neem products on earthworms (Lumbricidae). A paper presented at the Proceedings of the 3rd International Neem Conference, Nairobi, 1986. Schmutterer, H. Editor. (1995): The neem tree. VHC Verlagsgesellschaft, Weinheim, Germany. Singh, R.; Singh, S. (2000): Neem for pest management: How to grow and use. Division of Entomology, Indian Agricultural Research Institute. New Delhi, India. Sridhar, S.; Vijayalakshmi, K. (2002): Neem: A users manual. CIKS, Chennai.